Of all fishing reel parts, the drag system is the most important part of the reel. Let's get into the details a bit further. First, does it really matter whether your reel's drag is the absolute best on the market? This is an economic decision you will have to make. Generally speaking, the better the drag, the better the reel. However, many people think that with regard to fly fishing, the true purpose of the fly reel is only to hold the line and backing. After all, they have to go somewhere, right? In reality this is only partially true. If you were fishing for little bream or small bass for example, I'd agree that parking your line on the reel is about the only important reason for even having a fly reel. However, if you fish for anything more substantial that the itsy-bitsy fishy you will need a reel that has some other purpose. And that's where the drag system comes in to play. 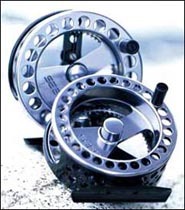 Drag is the term used to describe the resistance applied to the reel spool to prevent Mr. Fish from stripping line away too quickly. For example, if you hook a 700 lb shark, and you have your drag set too light, the shark is going to run and strip line off your reel like it wasn't even there. In this case, you’d need to tighten the drag so that you still allow that monster to run, but you control his run instead of losing control and having him come back really mad and eating you. If you tighten down the drag too much and don’t allow your fish to run at all, then you run the risk of your leader or tippet or wire snapping from the tension. End of run. End of game. Fishing reel parts include two basic but very different types of drag systems on a fly reel with which fisherman need to be concerned. The S&P drag system functions by increasing or decreasing tension against a spring applying pressure through a triangular shaped pawl against the reel’s spool. If adjustments to the tension are possible, they can be either internal or external using a lever or knob. Single spring-and-pawl drags are usually less expensive reels. With the spring and pawl drag, the line is pulled out very smoothly without variations in the amount of tension. By eliminating the unevenness in tension, the fly reel does a better job protecting the tippet. The drawback of a spring-and-pawl reel is that it is not designed for 700 pound sharks or even the behemoth rainbow trout. While they work extremely well for the smaller fish (say under 5 pounds), they don't work as well as the newer disc-drag models do when you latch on to a larger fish. I can't stress this point enough; if you are fishing for the typical trout and you want to save some money, buy the click & pawl reel -- it's maintenance free. But, if you seek pike, steelhead, or a saltwater critter, get the disc drag. The disc drag reel allows you to apply more or less tension to the fly line simply by turning the drag control knob on the reel. Two types of disc drag systems exist: the caliper disc-drag and the "true" disc-drag; the most important of all fishing reel parts. The caliper disc-drag is usually considered inferior. However both work well in the short run. For better longer lasting service, I'd go with the "true" disc drag systerm. If the "true" disk drag is not part of that expensive fly reel you've been looking at, don't buy it. "True" disk drag reels excel in large fish situations such as big trout, steelhead, salmon and monster Shark. The disc drag reel is designed to exert a smooth but hard pressure on the fly line without seizing up and is ideal when large fish strip out lots of line. Personally, I'd rather get the disc drag because they work better for the larger fish. And I don't see how catching smaller varieties with a disc drag model is harmful. 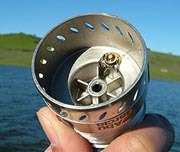 You will have to lubricate your reel however, but to me that's part of the fun of the sport of fly fishing. Which parts of the fishing reel are the best fishing reel parts for you? Is it the click & pawl or the disc drag? To be sure, there are probably as many "different" drag systems as there are manufacturers of fishing reel parts. However, generally these systems are offshoots from or revisions of the basic two systems described above. My advice --- think of the poem Invictus by William Ernest Henley; "I are the master of my fate, I am the captain of my soul" and you will make the right decision. And always remember to RESEARCH, RESEARCH, RESEARCH --- before you buy.